Note Due to security related fixes in the Client Launcher, it is highly recommended to update Email Archive Client manually or via an automated software deployment. New MailStore Gateway: Free add-in application that provides POP3 and SMTP proxy functionality. Additionally it also provides limited mailserver functionality to receive messages from other email servers via SMTP, such as Microsoft Office 365 or Google G Suite. A new archiving profile has been added to the Email Archive Client for archiving emails from MailStore Gateway. New The dashboard of the Management Console informs about potentially insecure (e.g. unencrypted, Ignore SSL warning set) outbound connections to email servers. New Safe Mode: Instances can be started in Safe Mode to resolve configuration issues without interfering with profiles, jobs, or users. Improved Outlook Add-in: Secure Connection is enabled by default on new installations. Improved Notification for failed license update attempts. Improved Changed retry logic for failed license update requests. Fixed Client Launcher: Initial connection is always using TLS 1.0 instead supported higher TLS version. Note This version fixes a critical security vulnerability. All customers running an affected version of MailStore Service Provider Edition should update their installations as soon as possible. New Retention Policies: By creating a set of retention policies, administrators gain full control over how long different type of messages are retained in the archive and whether messaged are to be removed automatically at the end of the retention period. For each message, administrators may check how current retention settings affect that message. New Automatic Update Check: Available updates are shown on the dashboard of the Management Console and notifications are sent to SPE admins via email if possible. New Automatic Update of Web Access: Updates are automatically installed to ensure latest security updates are available to end customers as soon as possible. New Branding: Updates can be pushed to Client Access Servers by ReloadBranding API command and activated without the need to restart the Client Access Server role. New Management Console: Added SMTP settings page which allows service providers to configure SMTP settings. These settings are are used to send notifications to SPE admins, e.g. about available product updates. Improved Jobs: $archiveadmin user is limited to see, edit, and execute his own jobs only. Improved For security reasons, the username of the first admin user must now be entered during initial configuration. Improved Added TLS 1.1 and TLS 1.2 support to connections between Management Server, Instance Hosts, and Client Access Servers. Improved Client: Added TLS 1.1 and TLS 1.2 support to outgoing connections when accessing Client Access Server. Note It is highly recommended to update the Email Archive Client manually or via an automated software deployment to already ensure TLS 1.1 and TLS 1.2 compatibility during the initial connection to the Client Access Server. This is mandatory if TLS 1.0 is disabled on the Client Access Server system, e.g. for PCI compliance. Improved Web Access version now visible on dashboard of the Management Console. Fixed Client launcher may be used to execute arbitrary applications if files are put in specific directories on the client computer. Note It is highly recommended to update the Email Archive Client manually or via an automated software deployment to resolve this security issue. 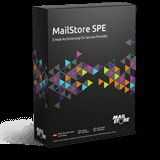 After the udpate, the Email Archive Client will no longer be able to connect to older MailStore SPE instances. Fixed Log output of certain operations (e.g. VerifyStore) cannot be copied to clipboard. Fixed MailStore references in SMTP test message. Fixed MailStore references Status Reports. Fixed Client Access Server crashes under certain circumstances when the archive is being accessed using the Legacy Web Access or Outlook Add-in. New Status Reports: Administrators can regularly receive status reports by creating a corresponding job. These reports contain relevant information from all areas, like successful or failed profile and job executions, licensing information, and much more. Improved Instances are automatically started upon creation if the Startup Type is set to Automatic. Improved Status of service provider access is now shown on administrator's dashboard. New Restriction of $archiveadmin user. This special service provider user will no longer be able to browse, search, or export email of other users. Improved Update of software licenses. Fixed Client: No login possible after previous occurrence of 404 error. Fixed Management API allows $archiveadmin user to move folders into his own archive. Note This version fixes two critical security vulnerabilities in Web Access. All customers running an affected version of MailStore Service Provider Edition should update their installations as soon as possible. New Full encryption of databases and audit logs. In addition to the existing encryption of the email contents and sensitive data inside the databases, all databases and the internal audit log are also fully encrypted as of this version. This requires an upgrade of all archive stores. Please read the update notices carefully to learn more about the upgrade process. Improved Archive Stores now support different locations for database, index and content files. This is also fully supported by the auto-create store feature. Fixed Management API allows instance IDs to be longer than allowed by the Management Console. Instance ID is limited to 32 characters’ now, with a minimum length of three characters. Improved Slightly improved SPE Service Configuration Tool user interface. New Debug log for connections to integrated IMAP server can be enabled per instance. New Brandable default website when accessing client Client Access Server without instance ID. New Fixed URLs for downloading client and Outlook Add-in from Client Access Server. Improved Branding now supports changing of the favicon. Fixed Instance stops responding under certain circumstances when multiple simultaneous request are send to a LDAP based directory service. Fixed Offering non-supported Windows authentication in login dialog of client. Improved Management Console: Opening the instance details is now possible with a single click on the corresponding list item. Fixed Management Console: Status of Client Access Server and its TCP ports are not taken into account by CreateClientOneTimUrlForArchiveAdmin API method, which is used when accessing an instance through the Management Console. Fixed The client branding is not applied correctly if the images used do not have a resolution of 96 dpi. Fixed The API HTTP server doesn’t use the configured server certificate. Instead, it uses the server certificate of the Management Console’s HTTP server. Improved Management API: An optional argument instanceUrl has been added to the CreateClientOneTimeUrlForArchiveAdmin method, allowing to specify manually specify the client access server to be used. Improved Management Console: Various minor user interface improvements. Fixed The login page of Mobile Web Access does not show the service provider-specific branding. Instead, a MailStore logo is shown. Note The add-in for Microsoft Outlook now requires Windows Vista SP2, Windows 7 SP1, Windows 8 or Windows 8.1. Users still running Windows XP can however use the latest 8.5 version of the add-in to connect to MailStore Service Provider Edition 9.